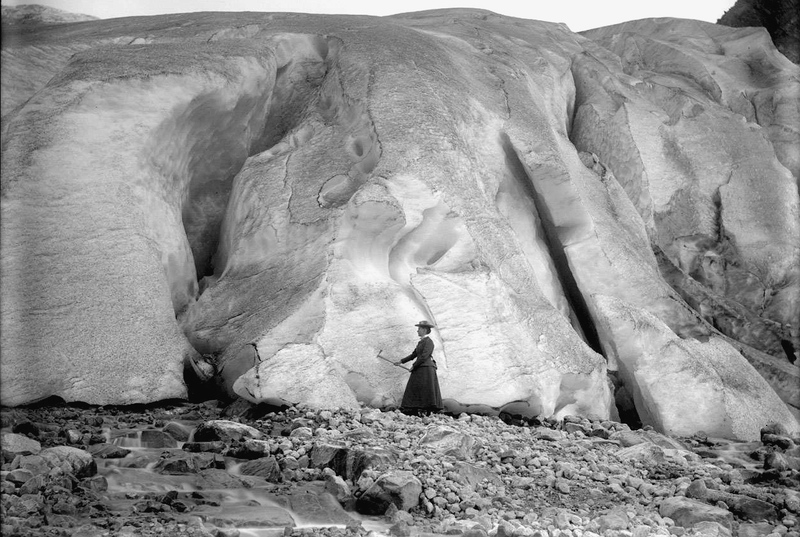 Although her name is not widely known, Mary Vaux Walcott (1860—1940) was a true trailblazer during the Victorian era, and left a remarkable legacy encompassing the diverse fields of art, photography, glaciology, botany, and mountaineering. Mary Morris Vaux was born July 31, 1860, into an old and prominent Philadelphia Quaker family. She received a “guarded” education at the Friends Select School in Philadelphia, where the curriculum included Catechism, daily Scripture readings, and weekly Meetings for Divine Worship, in addition to academic subjects. Following the death of her mother soon after graduating, Mary assumed the family’s domestic responsibilities, caring for her father and two younger brothers and managing the family homes in Philadelphia and nearby Bryn Mawr, where she also oversaw the family dairy farm. Mary first visited western Canada at age 27 with her father and her brothers. The year was 1887, the second summer the Canadian Pacific Railway (CPR) offered transcontinental railway service, and the first year it offered lodging at Glacier House near Rogers Pass, British Columbia. 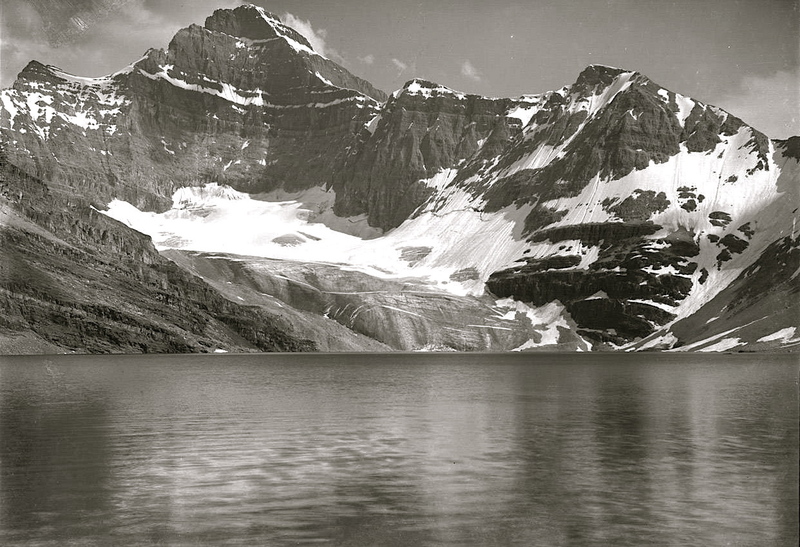 The completion of the CPR had opened the alpine region of western Canada, and ushered in the development of tourism and the sport of mountaineering. Captivated by the breathtaking majesty and unspoiled grandeur of the region, Mary returned with various family members nearly every summer for four decades beginning in 1895. Mary and her brothers undertook the study of glaciers in Alberta and British Columbia, surveying, mapping, photographing, and measuring glacial movement. These studies remain vital to scientists today in understanding climate changes and land-shaping processes. Mary’s contributions were rewarded with election to the Academy of Natural Sciences of Philadelphia in 1892; she was among the first women to receive this recognition. Mary had learned the platinum photo printing process from the noted Philadelphia photographer, William H. Rau. She handled the technical aspects of the glacier photography, printed the photographs, and took many landscape photographs used by the CPR for promoting rail travel. Mary was a member of the Photographic Society of Philadelphia, and an associate member of the Photo-Secession, founded by Alfred Stieglitz in 1902. 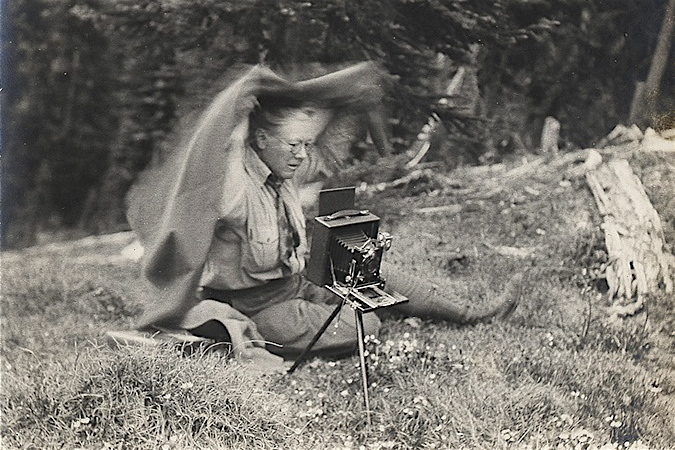 She showed her photographs in exhibitions sponsored by both groups, published them in numerous publications including National Geographic Magazine, and gave frequent magic lantern lectures with her own hand colored slides about her travels and research. More than 2,500 of the Vaux family’s original glass and film negatives and lantern slides are now in the collection of the Peter and Catharine Whyte Museum in Banff, Alberta. Mary became an avid outdoorswoman, hiking, camping, and exploring the Canadian wilderness on horseback. On July 21, 1900, ten days before her 40th birthday, she became the first woman to climb Mount Stephen—and the first woman to ascend a peak over 10,000 feet in Canada. In 1908 a peak was named for her: Mount Mary Vaux rises prominently to 10,881 feet over the Maligne Lake valley in Alberta’s Jasper National Park. She was a charter member of both the Alpine Club of Canada and the Trail Riders of the Canadian Rockies. Mary estimated that she had ridden some 5,000 miles on horseback through the Canadian wilds in her lifetime, and she celebrated her 77th birthday with a 20-mile ride in the mountains. In 1907, Mary Vaux met Charles Doolittle Walcott (1850 —1927), noted paleontologist and Secretary of the Smithsonian, during his first visit to Canada. The two were married in June 1914, and Mary became a first-time bride the month before her 54th birthday. Mary and Charles lived in Washington, and spent three to four months each year in Canada for the next 12 years. 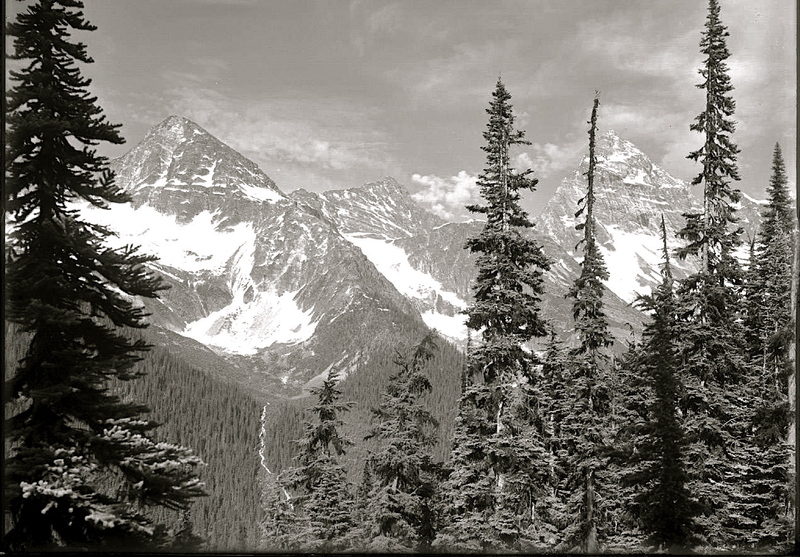 It’s important to recognize the hazards and harsh conditions during these months-long excursions in the rugged Canadian mountains: it was a true wilderness where sudden snowstorms, cold, drenching rains, grizzly bear encounters, and pack horses carrying supplies and specimens falling to their deaths were not uncommon. 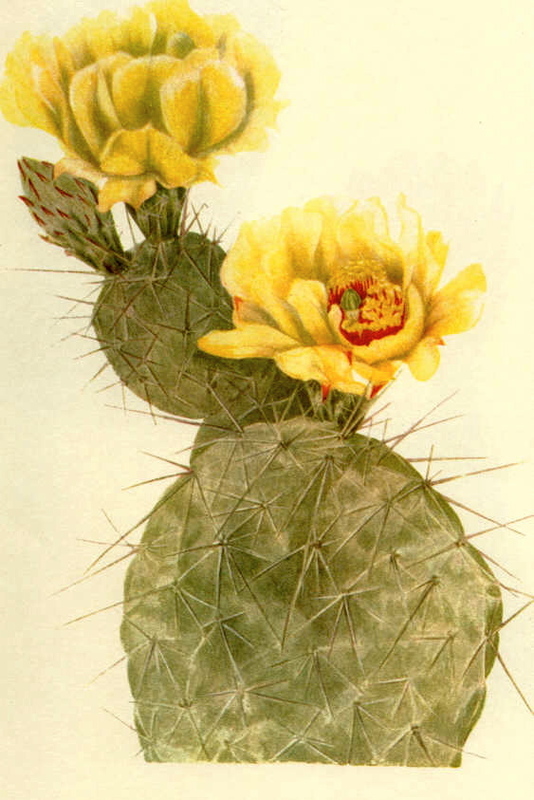 Over the years, her botanical watercolors grew in number, and in 1925 the Smithsonian published North American Wild Flowers, a five-volume set of 400 color lithographs of her watercolors accompanied by her written descriptions of each plant. 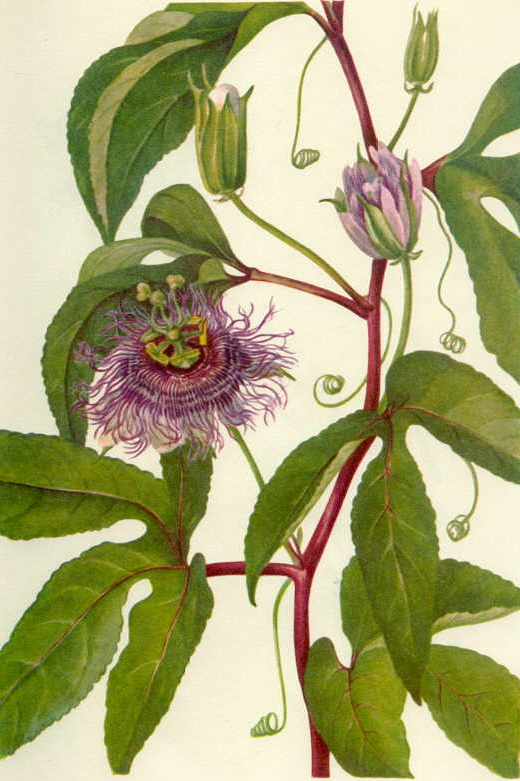 This seminal work led to her designation as the “Audubon of botany.” The original 809 watercolors are now housed in the collection of the Smithsonian American Art Museum. In 1927, both Mary’s husband Charles and her brother, George Jr. died. George had served on the United States Board of Indian Commissioners, a watchdog group charged with investigating and overseeing the Bureau of Indian Affairs. Mary was appointed by President Calvin Coolidge to fill his vacancy on the Board. She was reappointed by President Herbert Hoover and served until 1933, when the Board was disbanded. During her tenure with the Board of Indian Commissioners she traveled across the country nine times by car, made some 100 visits to Indian reservations, and presented her findings in written reports to the Board. She took the opportunity to collect Indian artifacts on these trips, and donated a number of the pieces to the Smithsonian. Mary Vaux Walcott made her final visit to western Canada in 1939. She died of a heart attack August 22, 1940, just after her 80th birthday, while visiting friends in St. Andrews, New Brunswick. She is buried in Rock Creek Cemetery in Washington, next to Charles Walcott. It’s no secret that Steve and I love antiques. We have no idea how many antiques shops we’ve been in together, and rare is the week when we don’t poke around in at least one. We love the thrill of the hunt, just looking at odd and interesting old things, and incorporating our finds into our lives in meaningful ways. 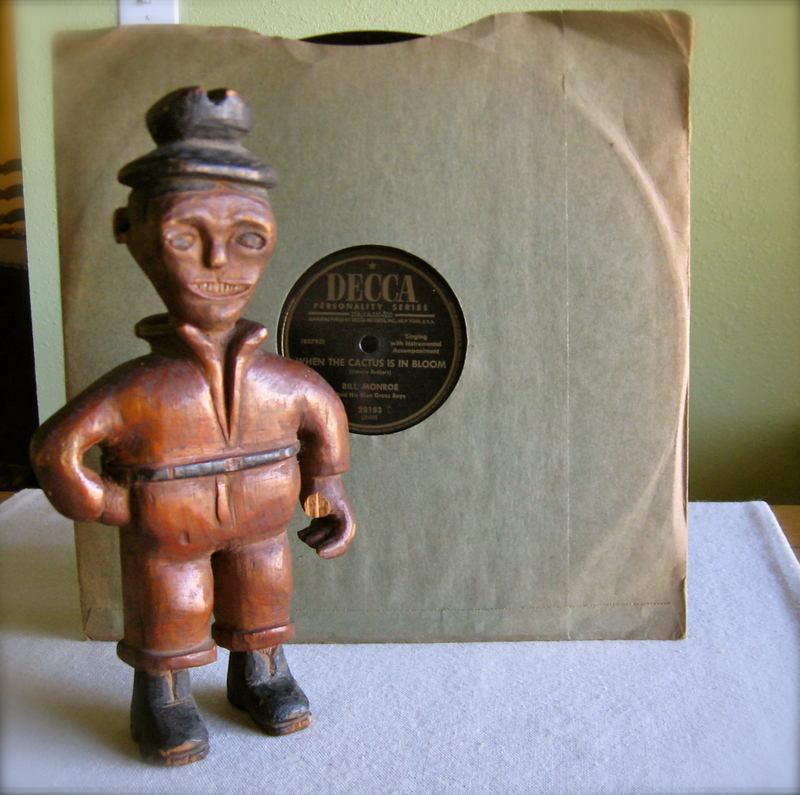 An early Tennessee folk carving and a Bill Monroe 78, recent serendipitous finds. Like most people, we have a few regrets over missed opportunities (the antiquer’s equivalent to the “one that got away”): the now legendary “Whore Sofa” in Wisconsin, “The Lamp” in Kentucky, the stereoscope on a stand in Tennessee. But these are balanced with the “finds” that have made it home—a rare Currier & Ives print of “the Wonderful Albino Family” we found in Nebraska, a delightful early 20th-century folk carving from East Tennessee, and our most recent purchase, a late 19th-century patent medicine crate which is enjoying a new life holding a portion of Steve’s collection of pre-war hillbilly 78s. We love these objects for the stories they tell, the mysteries they don’t, the adventures we have finding them, and the warm patina that only age can impart. 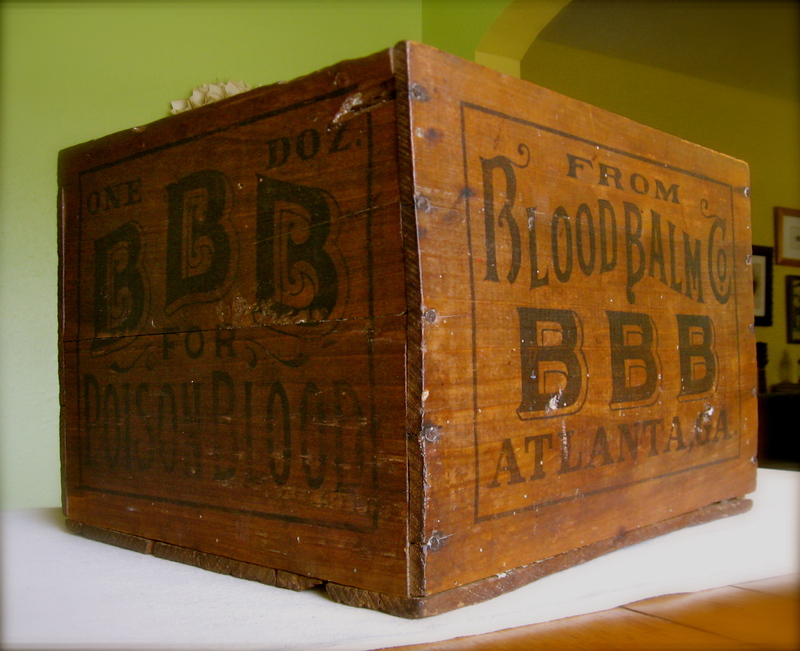 Botanic Blood Balm box, found in East Tennessee. So, what originally attracted us to an old wooden box, whose original purpose was to protect a dozen bottles of a quack medicine from breaking during shipping? First, it appeals to us visually and meets the aesthetic criteria we’ve established for our home. Second, we are huge fans of both late 19th-century advertising and the “patent medicine” craze that paralleled it, and you just don’t see these kinds of crates every day. Third, it’s useful: we’re always looking for attractive storage solutions. And finally, the price was right. What we have since learned—because we try to research everything we buy after hauling it home—is that, like all objects, our box has its own story to tell. Even the humblest objects have value as cultural artifacts if we take the time to examine them within the context of their original creation and use. 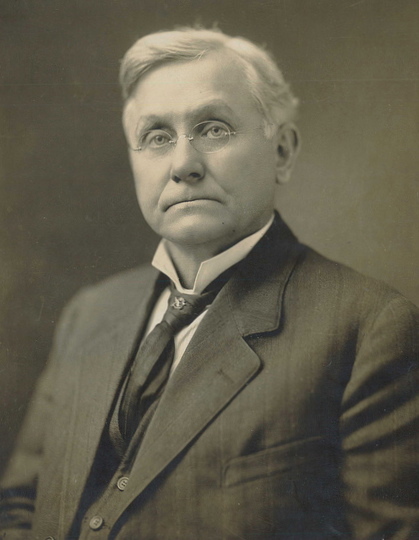 Asa Griggs Candler (1851—1929) was born into a well-connected, prosperous, slave-holding family in Villa Rica, Georgia, just west of Atlanta. He had originally hoped to become a physician, and spent his childhood concocting pretend potions and doctoring sick animals. The Civil War interrupted his schooling and devastated his family’s finances, ending his dream of higher education. Instead, he was apprenticed as a teenager to learn the pharmacy trade. At 21, his training complete, Candler arrived in the booming city of Atlanta. It was the golden age of patent medicines, and Atlanta was about to become the patent medicine capital of the South. Rife with post-war illnesses, poverty, malaria, and yellow fever, as well as ringworm (which roughly half of Southern children suffered from), the South offered great marketing potential. Candler quickly saw that the pharmacy field might be more lucrative than being a physician. The ascent of print advertising in the post-Civil War decades and the lack of government regulation over proprietary medicinal compounds contributed to the dramatic rise in “miraculous” and “curative” tonics, elixirs, ointments, and waters, often advertised to the public with false or misleading claims. Simultaneously, the development of electricity led to “medical” inventions like Dr. Dye’s Celebrated Voltaic Belt with Electric Suspensory Appliances, which promised the speedy relief of impotence. In the 1890s, patent medicines “offered the ad-writer his greatest opportunity,” wrote advertising pioneer Claude Hopkins. 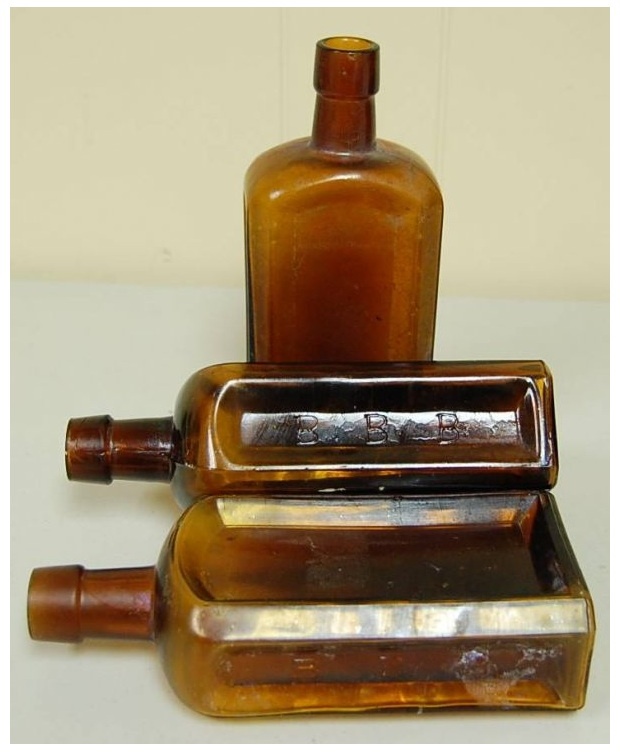 A group of 3 rare Botanic Blood Balm medicinal bottles. Even without their labels, these bottles are highly collectible today. At their best, patent medicines could be harmless or even moderately useful; at their worst, they were downright dangerous. Many of them contained grain alcohol, opium, or cocaine (which did make people feel better—at least temporarily), while others contained toxic chemicals including arsenic, mercury, strychnine, and lead. Asa Candler began buying the rights to a number of patent medicines, including Bucklen’s Arnica Salve (for all manner of fever sores, tetter, chilblains, “positively cures piles”); King’s New Discovery (for consumption, colds, and coughs); and De-Lec-Ta-Lave (to whiten the teeth, cleanse the mouth, harden and beautify the gums). By 1886, Candler (himself a hypochondriac who was likely dabbling in his own products) was advertising his Electric Bitters, touted to cure depression, poor appetite, headaches, nervousness, and more, at the price of 50 cents per bottle. In 1888, he purchased the rights to the elixir for which he is best remembered, Coca-Cola. 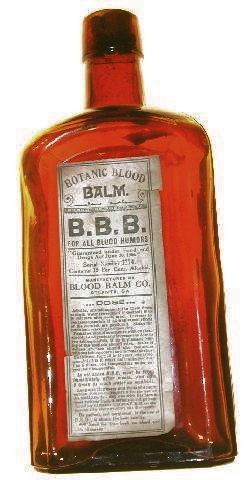 Botanic Blood Balm, which Candler marketed at the price of $1 for a large bottle, was claimed to make the blood pure and rich and stop all aches and pains. This “scientific wonder” promised positive and permanent relief from “blood poison,” and to quickly cure “old ulcers, scrofula, eczema, itching skin and blood humors, cancer, festering sores, boils, carbuncles, pimples or offensive eruptions, pains in bones or joints, rheumatism, catarrh, or any blood or skin trouble,” as well as “female weakness” and “hereditary taint.” It was also boldly claimed to be a perfect cure for syphilis. There was just about nothing B.B.B. couldn’t cure! In 1891, Candler sold his entire stock of pharmaceuticals to focus on Coca-Cola, and became one of the South’s wealthiest self-made millionaires. He sold B.B.B. to J.B. Brooks, one of his part-time traveling salesmen. The passage of the Pure Food and Drug Act in 1906 marked the beginning of the end for the patent medicine industry. B.B.B. 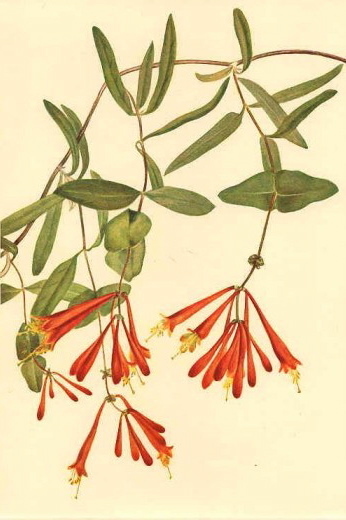 again changed hands, and was operating under William R. Warner & Co. of Philadelphia by 1916, when the company was fined $200 for misbranding and making false and fraudulent claims regarding the product’s efficacy; a chemical analysis found it to contain 14.6 % alcohol, along with senna (a purgative), arsenic, and other ingredients. 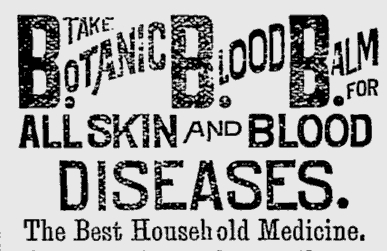 Newspaper ad extolling the many virtues of B.B.B. I don’t have many memories of my grandfather, Frank Anton Maschka. He died before my 5th birthday, and in my vague recollections of him, he’s either helping me learn to turn backwards somersaults, or I’m sitting on his lap in his Victorian platform rocker. I also recall that he played the violin and wore suspenders and string ties. Frank Anton Maschka (1882-1959) with his violin, c. 1910. 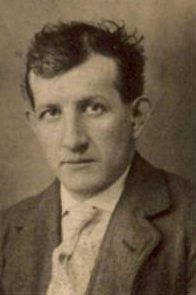 Born in Witków, Poland, on April 14, 1882, Frank was the first child of August Maschka, who had been a soldier in the Prussian army, and his wife, Rosalia Wesierski. August emigrated to the US in 1881, and Rosalia arrived with the newborn Frank in 1882. They went first to Ohio before settling along with numerous other Polish immigrants at Ashton, in Sherman County, Nebraska, five years later. There they built a sod house (soon replaced with a large frame structure), began farming, and raised a large family. I remember visiting the old homestead many years later, by that time long abandoned. Frank owned and operated a grocery/general merchandise store in the small, largely Polish community of Ashton, and with his brother, Alfonzo (Uncle Ollie), ran a successful sausage shop. Maschka’s Sausage is still in operation today in its original location. Ashton reached its peak population of 488 in 1940, before declining to fewer than 200 today. Some of my fondest childhood memories are set in that tiny Nebraska town. 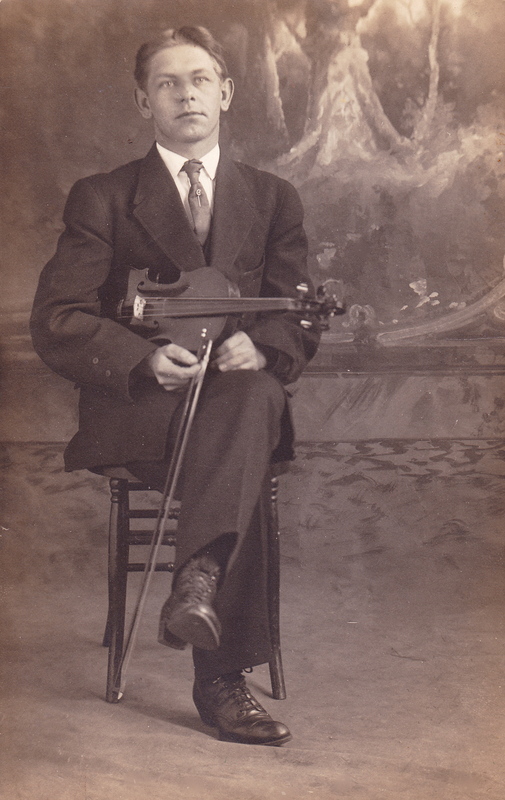 A hundred years after the photo was taken, the violin came into my possession, along with the bow my Grandpa Maschka holds in the photo. It hasn’t been played since he died in 1959, and it needs some work to return it to a playable condition. I hope to have the instrument restored so I can listen to it once again. Victorian table worked human hair and gold brooch. Steve and I have long been intrigued with 19th-century hair work objects. We’re drawn to the fragility, intimacy, and sentimentality of these objects, executed in incredibly painstaking detail from a most delicate and personal material, human hair. 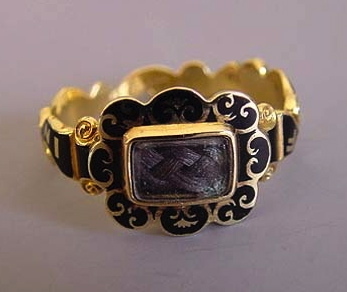 Gold and enamel mourning ring with hair of the deceased under glass, c. 1855. Frequently made into jewelry, hair was also used to create decorative art works. 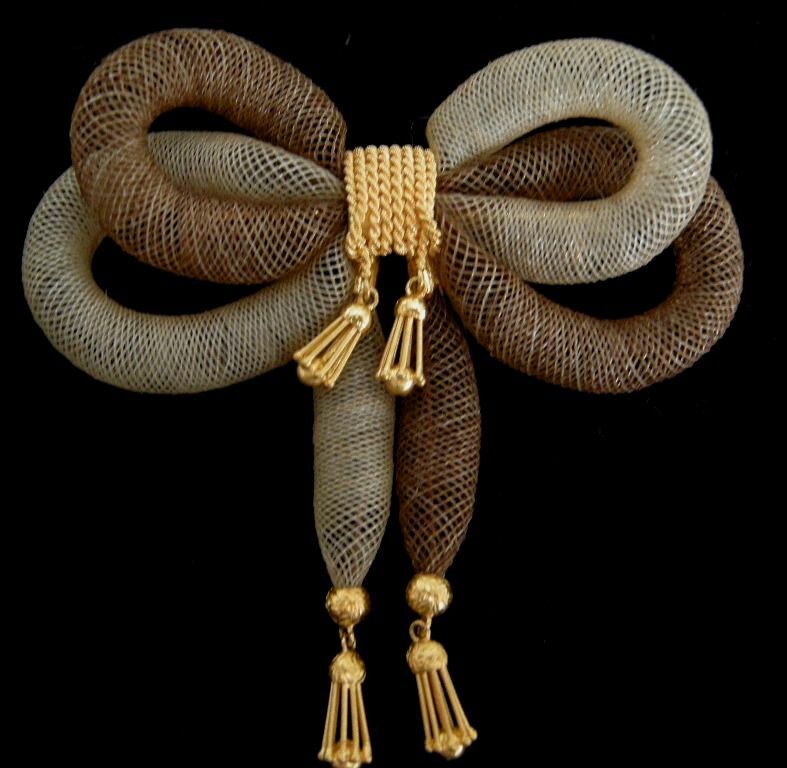 In fact, the variety of objects made with hair seems limitless, ranging from a simple lock of hair tucked into a locket, to intricate wreaths made of hair woven into flowers, to miniature paintings on ivory with sepia paint made from finely chopped hair. 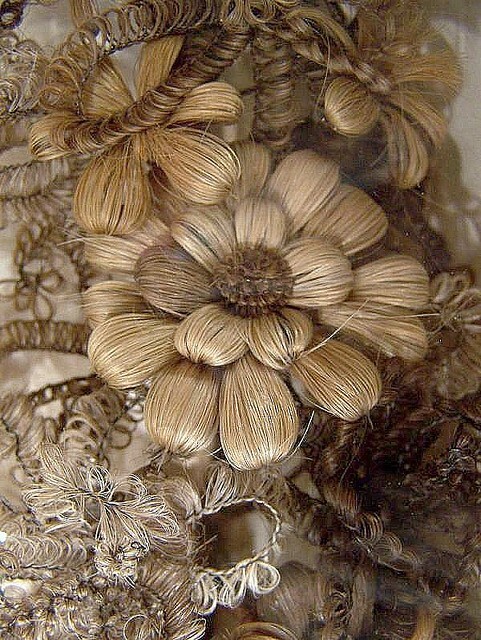 Hair from deceased loved ones was frequently used in mourning pieces, but more often the hair of the living was worked into sentimental keepsakes given as everlasting tokens of friendship, remembrance, or romantic love. 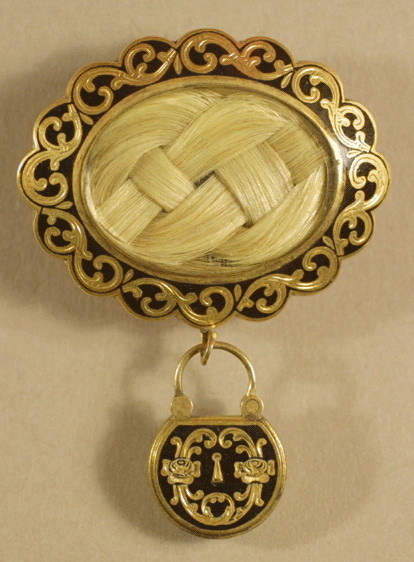 Mourning brooch of gold and enamel, with simply plaited hair of the deceased encased in glass, c. 1848. 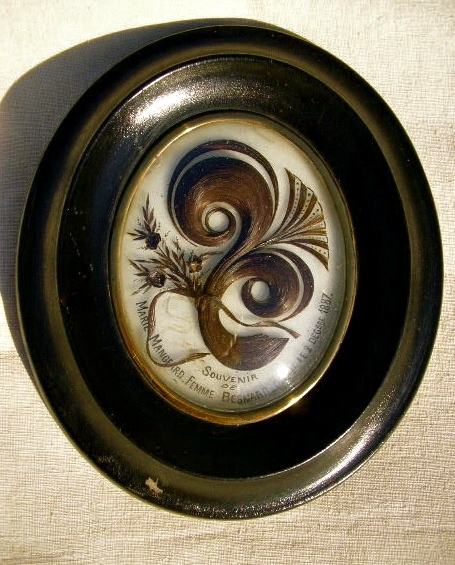 Although the use of hair in jewelry dates back many centuries, it reached its apex in form and popularity during the Victorian era, affording Victorians an opportunity to combine their obsession with hair and passion for elaborate ornament with their appreciation of the sentimental and the macabre. Rings, earrings, bracelets, necklaces, brooches, charms, cufflinks, and watch chains made of hair—and often elaborately embellished with gold, enamel, pearls, and precious or semi-precious gems—were all the rage. It didn’t stop there: shadowbox-framed hair wreaths decorated walls, and 3-dimensional bouquets and tableaux made entirely of hair were displayed under glass domes on Victorian parlor tables. 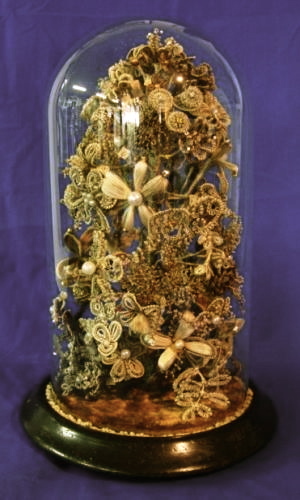 Bouquet of hair worked flowers under glass display dome, New Zealand, 1896. At the Paris Exposition of 1855, visitors were said to have flocked to a life-sized portrait of Queen Victoria created entirely of human hair. The trend-setting Victoria was fond of hair work, and presented a bracelet made of her own hair to Empress Eugenie of France, who was reportedly moved to tears by the gesture. Following the death of her beloved husband, Prince Albert, in 1861, Victoria wore a lock of his hair in a brooch pinned over her heart for the rest of her life. 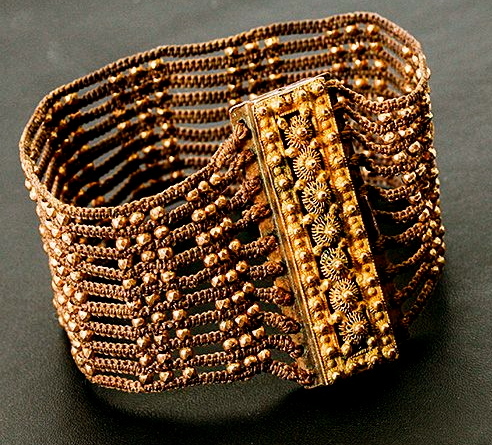 Bracelet of finely woven hair accented with gold beads and clasp, before 1850. Probably one of a pair that would have been worn as matched cuffs. Initially created by artisans and marketed in specialized shops and mail order catalogs, hair work soon became a popular parlor pastime for Victorian women. Publications including Godey’s Lady’s Book and Peterson’s Magazine published free patterns and instructions for DIY hair work projects, and schools were established in England and the US to teach young ladies the skill. Hair receivers became essential parts of a woman’s toilette set, to collect hair harvested from combs and brushes for later use. 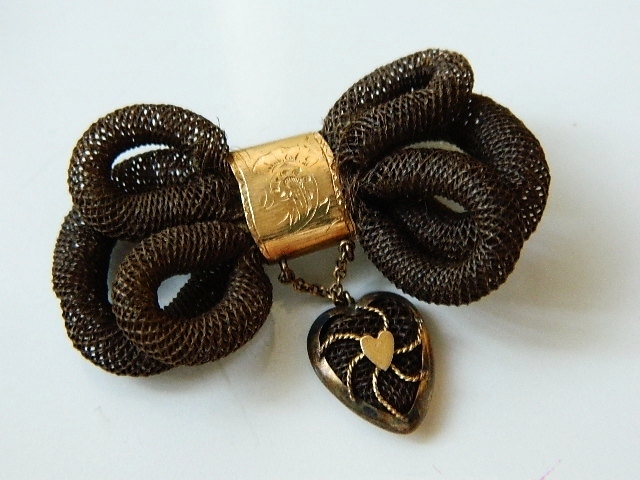 It has been suggested, only half-jokingly, that by the time hair jewelry began to fall out of fashion at the end of the 19th century, virtually every male had received a hair work watch chain from his fiancée, wife, sister, or mother; watch chains are among the most commonly found examples of 19th-century hair work today. 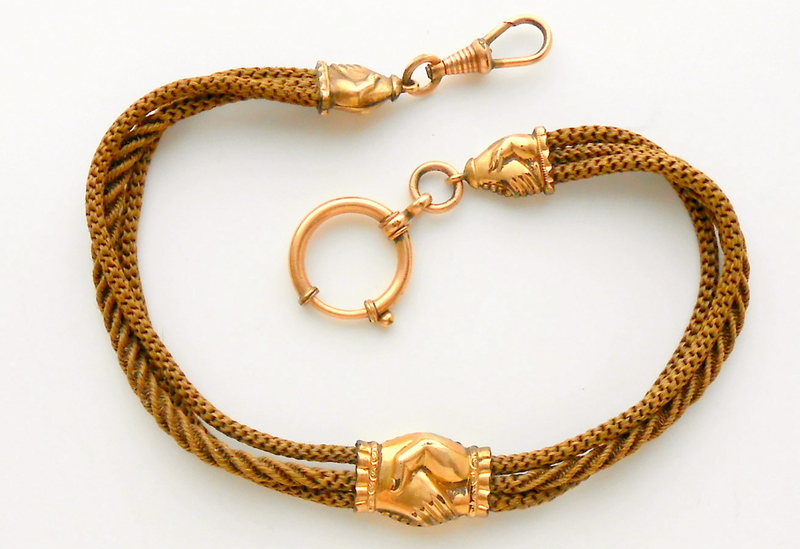 Victorian watch chain of human hair with gold clasped hand detail. Below, we’ve assembled a small sampling of hair work, with brief descriptions of some of the techniques involved. 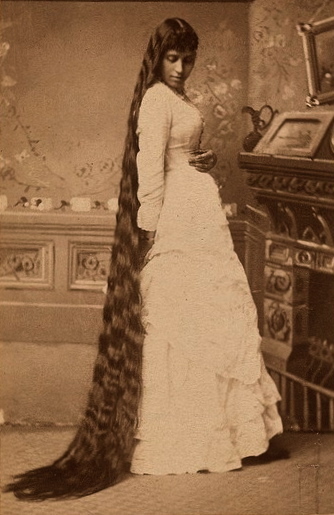 Raw material: a young Victorian woman displays her magnificent tresses. Palette work: Hair was cut into shapes and glued flat onto a surface such as vellum, ivory, or glass, to create designs that often resemble feathers and flora. Individual hairs could be used to create fine lines, or bits of hair could be sprinkled over the adhesive to add texture. French palette work mourning hair wreath with hair from the deceased in its original frame, 1887, my gift to Steve on our first Christmas together. One of the more distinctive devices in palette work was the Prince of Wales curl, made by heating a rod used as a miniature curling iron, fixing the curl with glue, and then weighting it for several hours. Three of these feather-like curls arranged together created the Prince of Wales plume. Brooch memorializing 2 deceased loved ones, gold and enamel with palette worked Prince of Wales curls from each deceased, seed pearls (representing tears) and gold wirework under glass, c. 1870s. mold still in place, it was boiled for 15 minutes, dried and removed carefully from the mold. It was then ready for mounting by a jeweler. 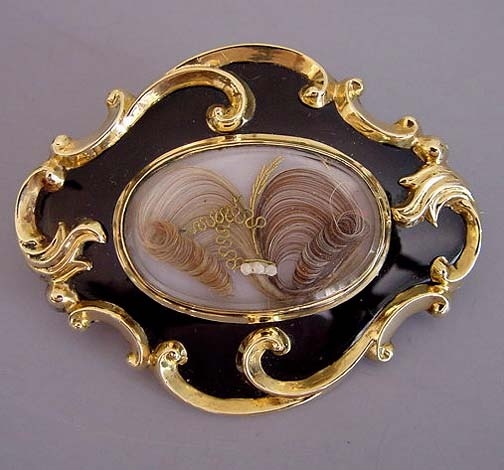 Brooch of white and brown hair, table worked and embellished with gold by the workshop of Antoni Forrer, 1847-1858. Forrer, a Swiss national, ran the leading hair work studio in London, employed a staff of 50, and included Queen Victoria among his clientele. Sepia Painting: Hair was chopped finely and added to gum arabic or an adhesive called “musilix,” or ground to a powder with a mortar and pestle and dissolved in distilled water to create a brown pigment that was applied to ivory, glass, or vellum, usually in miniature landscapes or scenes related to death and mourning. 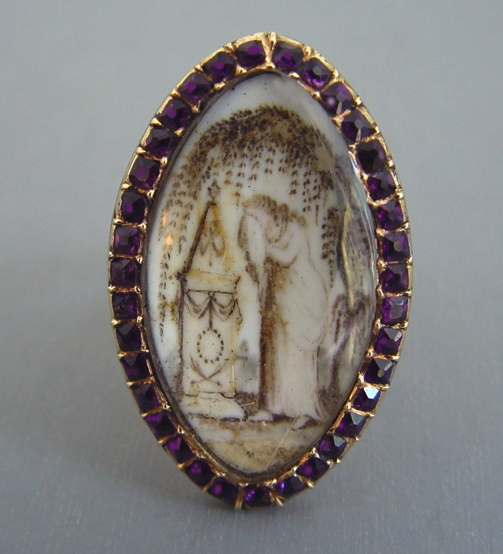 Georgian era mourning ring, sepia paint on ivory under crystal, surrounded by amethysts, depicting a woman standing at a tomb under a weeping willow, weeping into a handkerchief, c. 1784. Hair Flowers, Bouquets, and Wreaths: Hair flowers were made by wrapping the hair around a rod and using a fine wire to hold it together. By varying the size of the rods, the amount and color of hair used, and sometimes incorporating beads, many different shapes and sizes of flowers, leaves, and tendrils could be made and then joined into decorative bouquets or wreaths. 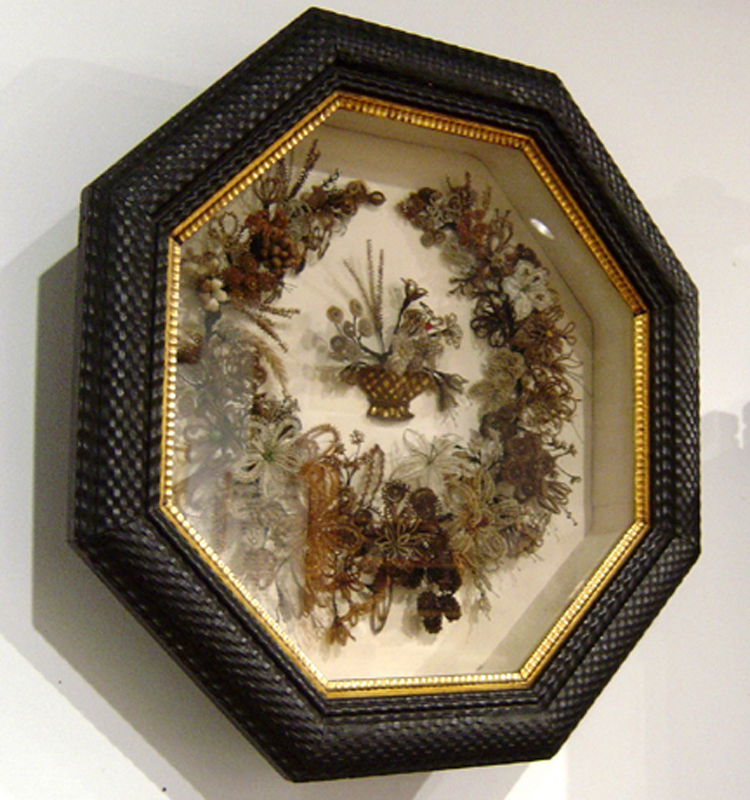 Victorian hair wreath in shadowbox frame. I recently began a journey that has already consumed many hours (and promises to absorb many more), taken more than a few interesting turns, and led me to some very unexpected places: I’ve been researching my genealogy. This project, born of simple curiosity regarding a single facet of family oral tradition, has brought history to life for me in new and meaningful ways, and has created a major shift in the way I view my cultural identity. I believe that most humans share an innate desire to know something about where we “came from,” and who “our people” were. We often define ourselves accordingly. To connect with our ancestors, it seems, fulfills part of a deeper need to understand our own place in the world. And if you think about it, the circumstances and choices of each of our ancestors have had a direct and powerful impact on who and where we are today. 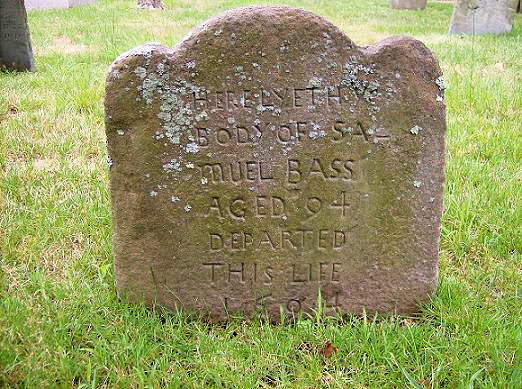 The grave of one of my eleventh-great grandfathers in Quincy, Massachusetts, dates to 1694. Our ancestry—the combination of genetics and upbringing—is an undeniable and indelible part of who we are as individuals, and determines a great deal about our lives even before we’re born. Even taking into consideration the fairly recent concept of upward mobility, political power, land ownership, wealth, and social status remain powerfully linked to one’s ancestry. Our ancestry can create opportunities or present obstacles, and manifests its influences not only through the more obvious inherited characteristics of racial group, physical appearance, and predisposition to certain illnesses, but it also shapes our cultural traditions and belief systems, career choices, behavior, personal values, and expectations. I’ve always considered myself a sort of displaced Midwesterner—an outsider without roots, who never really belonged anywhere. My pedigree has always been somewhat of a question mark, as my father was adopted, and the records of the orphanage where he spent the first eighteen months of his life were destroyed in a fire many years ago. My mother never knew her biological father, nor did she have any connection with his family. That leaves the line I’ve been researching, that of my maternal grandmother. The focus of my research traces the lineage of my mother, Patricia (b. 1929), through her mother, Anna Hoover (1902-1979), and her mother's mother, Susan Wilber (1867-1916). As I’ve begun to explore my family history, I’ve been able to piece together fragments that have begun to form the stories of my ancestors’ lives, and they have become real people to me. A few are famous, but most of them you’ve never heard of. They include magistrates and farmers, lawmakers and shoemakers, merchants and millwrights, and generation upon generation of homemakers and mothers. By reading histories of their communities and immersing myself in the history of the times in which they lived, I’ve gained a deeper understanding of them. My earliest non-native American ancestors came from England in the early 17th century as Pilgrims and Puritans, and I’ve been able to trace them to the English towns of Saffron Walden, Dorking, and Stratford-Upon-Avon. (The earliest ancestor I’ve found to date was born in 1350.) I’ve discovered their religious affiliations and birthplaces, where and when and whom they married, how many children they had, where—and sometimes, how—they died, and what they bequeathed their heirs. I have found houses they lived in and located final resting places on both sides of the Atlantic. I hope to visit some of these places in the very near future. 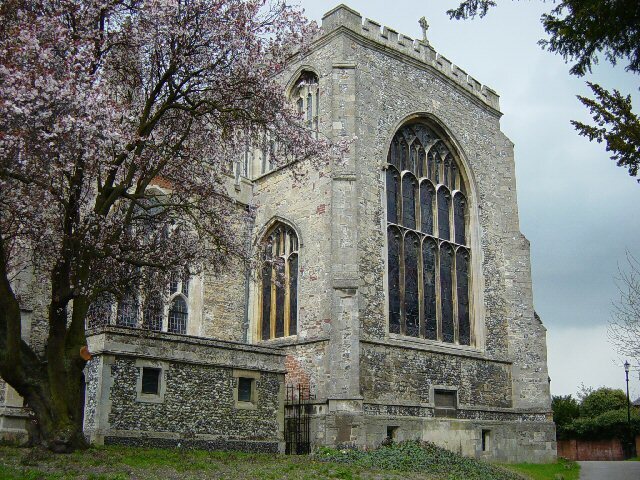 St. Mary's Church, Saffron Walden, Essex, England, where my ancestors were baptized, married, and their deaths recorded as early as 1540, appears much the same today as it did then. Through this process, I’ve learned not only how the genealogy “bug” bites, but I’ve gained insight into why it does. Researching one’s family history is a solitary journey, of little interest to anyone but the researcher. But for me it has been one well worth taking. I’m beginning to see myself less as that disconnected, rootless Midwesterner, and more as part of something immense and ancient, connected by the ancestral thread that unites us all to those who came before us. If you’ve attended one of our live shows, you are probably aware that band member Stephen Lee Canner writes nearly all our material. We do often add a “cover” or two to our set list—songs written by other songwriters we admire, and that for one reason or another we like to share with our audiences. Among our favorites is the heartbreakingly beautiful song, “Henry Russell’s Last Words,” written by Diana Jones. Inspired by an historical event, the song documents the final moments of a West Virginia coal miner trapped underground following a mine disaster. In The Victor Mourning’s version of the song, guitjo player Lynne Adele contributes lead vocals, Stephen Canner takes a rare break from singing duties to focus on delicately textured guitar accompaniment, and Stefan Keydel lends soaring fiddle solos that build dramatically to the song’s tragic climax. We hope to record the song for our next album. Henry Russell was born in 1885 in Hamilton, a town near Glasgow in the west central lowlands of Scotland. He worked as a miner in Scotland before emigrating to the U.S. with his pregnant wife, Mary, and their two young children. They moved to Monongalia County, West Virginia, where Henry found work at the Federal No. 3 coalmine in Everettville. 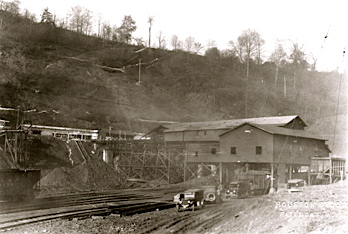 The day of April 30, 1927 probably began like just any other workday for the miners of the Federal No. 3. But the day came to a sudden end for 111 of the miners when a massive explosion ripped through the mine, killing most of them instantly. Only nine miners working that day survived. Several men survived the initial blast, trapped hundreds of feet underground for several hours before succumbing to gas fumes. Among them was Henry Russell. Russell gathered pieces of coal and scraps of paper torn from cement sacks, and began to write notes to his wife. 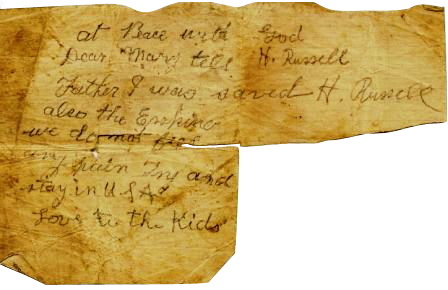 The notes, which he placed carefully in his lunch box, were found along with the bodies of Henry and his coworkers and passed along to Russell’s widow, Mary. Their daughter, Marguerite, was just six years old when her father died. Now in her 90s, she still has her father’s handwritten notes. On April 30, 2011, 84 years to the day after the disaster, the memorial was dedicated in the town of Everettville in memory of 149 coal miners who lost their lives in accidents there during the years the mine operated, 1918 to 1951. The memorial, which stands on a hillside overlooking the former Federal No. 3 Mine, is a 7.5-ton stone inscribed with the names of the miners, many of whom lie buried in unmarked paupers’ graves.